Every good designer knows the rules about page layout. Your eye goes first to the headline, then to the caption of the picture, then to the picture… whatever. But if you’re really serious about page layout and GUI design, you have to use eyetracking. Now, a group of artificial vision scientists who call themselves Feng-GUI Lab have created a piece of software that simulates the human vision process. You can upload a still image or a movie and in seconds approximate the results of a weeks worth of human testing. Their website allows you to try out a free image analysis every three hours. I tried an analysis of my home page. The result is displayed above (click on it for a larger view). 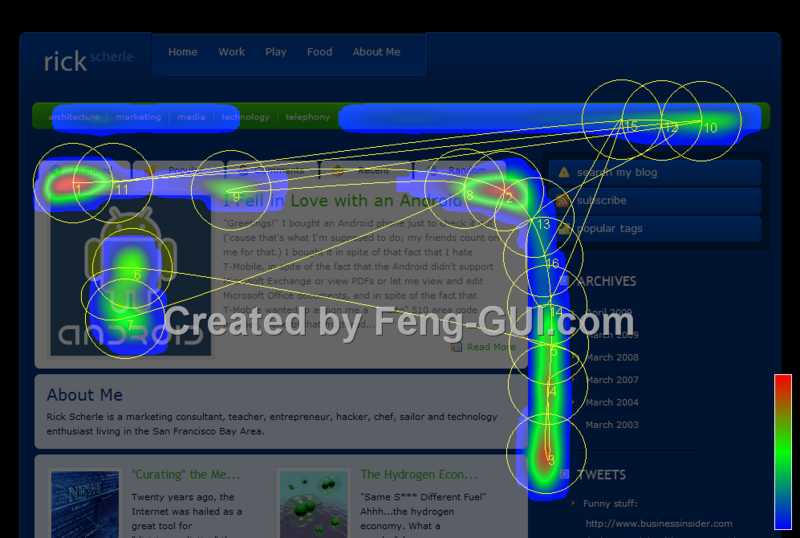 Feng-GUI also has a lot of interesting applications of AI vision analysis listed on their home page including “smart thumbnails,” the technique of only including the visually interesting part of a picture. Make your own AI eyetracking simulations here. This is great technology. I wonder how this would help with our internal Share Point site at work… I think I’ll take a page or two and see what the test results show.